This morning I treated my girls with a fastfood breakfast, but of course a more healthy option. The french fries are made of a jummie fresh mango, served with strawberry ketchup. I made a burger from 3 blueberry pancakes stacked on top of each other, it between I put some slices of mango (cheese) and strawberry (tomato) and topped it of with some black sesame seeds. Instead of a milkshake I made a strawberry smoothie to go with this fast food breakfast. 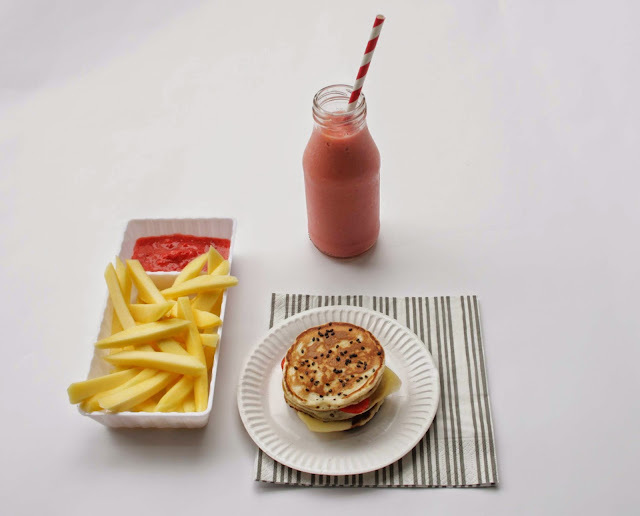 The girls loved it and it is quite a simple breakfast to make and a great way to incorporate fruit in a kids meal. Have a great weekend!